These four metrics are the ones pundits and fans constantly point to as indicators of success for a sport – but which one do you value the most? Against our better judgment, we’re going to be diving headlong into the code wars for the second episode of The Roar Podcast, and trying to determine what Australia’s most successful game is. Crowd figures have been the hot-topic throughout this year’s finals series and remain one of the most visible metrics we look at. Television ratings too, play a major role in the discussions – because not only do they show how many people are actually interested enough to watch it, they also dictate how healthy a league’s bottom line looks. But while the AFL, NRL and cricket dominate these, other sports hold sway elsewhere. 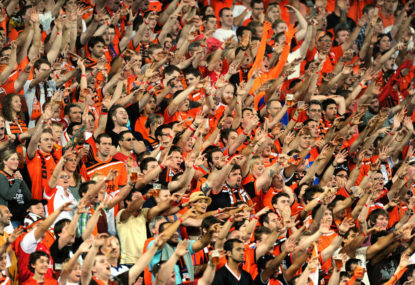 Relatively speaking, football and golf in Australia don’t draw the huge crowds, ratings or broadcast deals – yet they’re convincingly winning the battle of participation. 1,086,986 Australians play football every year, and 685,732 tee-off with some golf. Rugby league however, only attracts 247,883 players and rugby union doesn’t even make the top ten list. So today we’re asking you – if you were an administrator of your favourite sport, what one metric would you want to win? In other words, what is the single most important factor in determining a sport’s success? Chuck your answers in the comments and we’ll get to the best answers on the podcast. The Roar Podcast will be dropping in early November, keep your eyes peeled on the site for more information in the coming weeks!